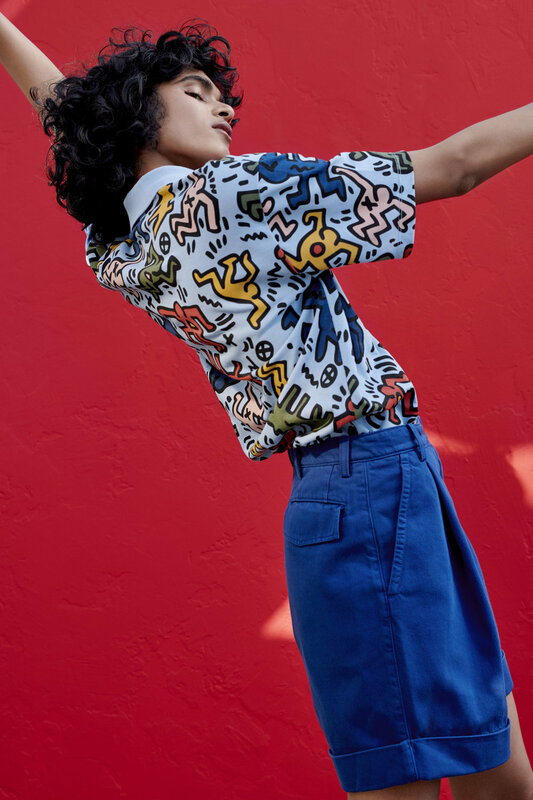 LACOSTE presents its brand-new collection with the 20th century pop icon Keith Haring. A street art genius of the 1980s, Keith Haring is known for the simplicity of his line, his bright colours outlined in black and his animated figures who express his energy, zest for life and spontaneity: common values shared with the French company, which pays homage to the unique world and vision of this pioneer who had already understood the importance of combining art and fashion. LACOSTE has delved into the oeuvre some better known than others and transposed them onto a wide range of clothing and accessories for adults and children. In line with a fashion world celebrating the return of the 1980s and the spirit of urban culture, these exclusive and original garments serve as a canvas for some legendary and timeless works by the multi-faceted American artist. A creative alchemy which generates a collection accurately reflecting the image of the two entities. The Keith Haring X LACOSTE line elegantly combines the eccentricity of an all-over print with the sobriety of iconic pictograms. Multi-colored or in negative, the famous figures which are the painter’s hallmark spread across polo shirts, T-shirts, shirts, sweatshirts, dresses and swimsuits or appear on the lining of a bomber jacket, a sneaker or a reversible tote bag. For younger people, three watches are also available. The equally legendary “Barking Dog” and “Heart” drawings are displayed on a T-shirt or discretely applied on the collar of a polo shirt or the back of a tennis shoe. With this collection, Lacoste pays tribute to an artist but also to a free, creative and timeless spirit. Conceived and designed for all those who want to inject a touch of art in their life, this colorful, pop-influenced collection will be available from March 27th at www.lacoste.com and in a selection of Lacoste stores.